Geospatial and statistical information are now being recognised as vital for evidence-based decision making for both the public and private sectors. Organisations at various levels make use of these datasets across various verticals. However, the combined power of these two rich data systems is yet to be explored completely and leveraged to their full potential. As a backdrop to the Sustainable Development Goals, statistical and geospatial information take further precedence, as the monitoring, assessment and evaluation of these goals and their associated targets and indicators can only be achieved with well integrated and reliable geo-statistical analysis. While many countries and organisations are already making significant progress in this direction, many of us are still struggling to manage the integration of these information bases. One of the main reasons for this is poor institutional coordination and cooperation between the national statistical and geospatial agencies, which is vitally important to the success of the integration. Also of importance for this integration is the development and implementation of technical standards, methodologies and common metadata that link geospatial and statistical data. 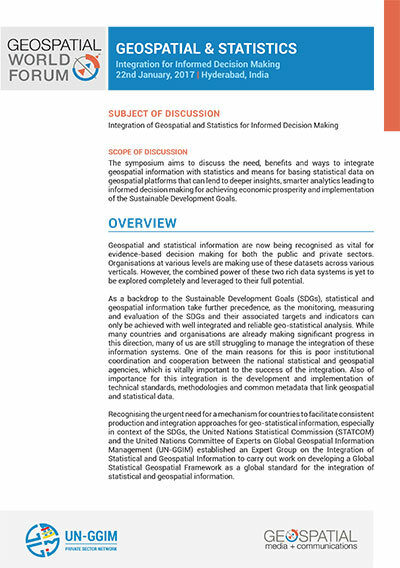 Recognising the urgent need for a mechanism, such as a global statistical-geospatial framework, for countries to facilitate consistent production and integration approaches for geo-statistical information, especially in context of the SDGs, the United Nations Statistical Commission (STATCOM) and the United Nations Committee of Experts on Global Geospatial Information Management (UN-GGIM) established an Expert Group on the Integration of Statistical and Geospatial Information to carry out work on developing a statistical-geospatial framework as a global standard for the integration of statistical and geospatial information. Geospatial World Forum 2017 will host a pre-conference programme on Geospatial & Statistics: Integration for Informed Decision Making that will look at ways, reasons and benefits of integrating geospatial and statistical information for making better policies and decisions, achieving resource optimisation, monitoring resources and developing sustainable revenue models.